There are two symbols that you need to understand. The first one is the downstroke: ͆ . This means that you pick the string from above, downwards to the ground. And then there´s the opposite, the upstroke: ˅ . This means that you start under the string and pick it upward to the ceiling. These are the two motions that you should use in perfect symbiosis. And of course, as the name of the technique suggests, you should alternate between downstrokes and upstrokes. This is not so hard, but probably a bit harder than it looks. Be sure to hit the strings at exactly the right time, so you´ll sync the left and the right hand. If you start out too fast, things will get sloppy and your alternate picking will sound bad. Many jazz, latin and funk players has good knowledge of this, because the phrazing they use often a bit more sophisticated than what a rock guitarist would use. But this is valuable knowledge to rock and pop guitarists as well, because to emphasize the right notes in a phraze is often what makes the difference between a good and a great player. However, don´t build an absolute rule around this. Sometimes it will sound better to use a downstroke on a syncope, especially if you want this tone to stand out. I have also seen guitarists who strokes up and down in the air when they have a pause in a phraze, just to get the up and down motion going. This way, they will hit syncopes on upstrokes, for sure, but I think it´s a waste of motion. Sometimes, these guitarist will have a problem to really play in a free way, and the result is always a bit stiff. My advice is to become aware of when to use a downstroke or an upstroke, but don´t be a slave to it. Practice well, practice with awareness and practice every day, and eventually you´ll work the technique into your brain and hands. Then you will be able to use the technique well, without much thinking, and then you can focus on the music. And when you focus on the music, you don´t flap around with your pick when a phraze has a rest - there´s more important things to keep your mind on. Practice alternate picking often, it´s an essential tool to becoming a great guitarist. And most important of all, practice in a good way, so you don´t get sloppy. Start at a low pace, and once your comfortable and don´t make any mistakes, move on to a higher tempo. 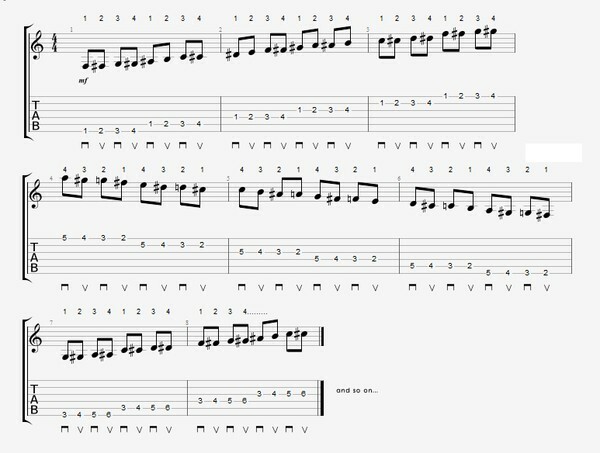 There will be more alternate picking exercises on this page, for sure!